In January we created a survey to understand how folks were using Visual Basic 6.0 and Visual Basic .NET in the UK. This survey was sent out to individuals we “suspected” had Visual Basic 6.0 heritage but it was also widely advertised through the MSDN Flash to UK developers. This does not (nor was it ever intended to be) a survey across all platforms. 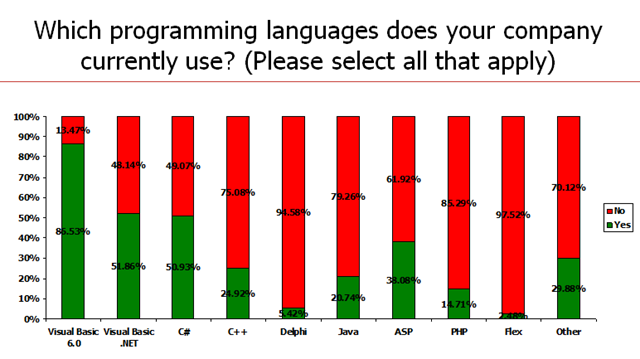 The focus was very much Windows developers – therefore we would expect to see low usage of Java etc. P.S. If you work in a UK company with Visual Basic 6.0, then it is probably worth you checking out something we pulled together to help. Great information. I found it interesting that the Visual Basic .NET and C# usage is pretty much tied. Our experience is that we get more leads to move from VB6 to C# than to VB.NET. Looking forward to the rest of the data!! Amazed at the number of people using VB 6.0. 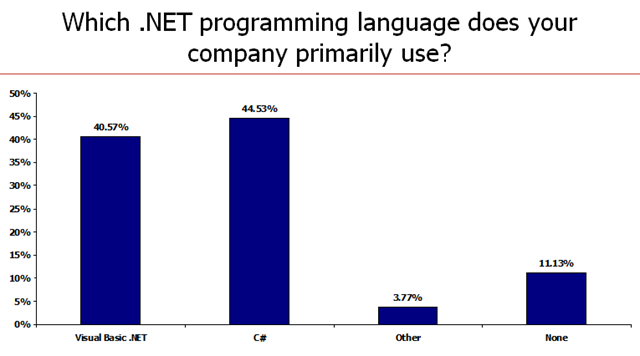 Like Jose, I'm surprised how many are using VB.NET compared to C# (I would have thought C# would have been more dominant). Mostly I'm surprised at anyone still using .NET 1.1. 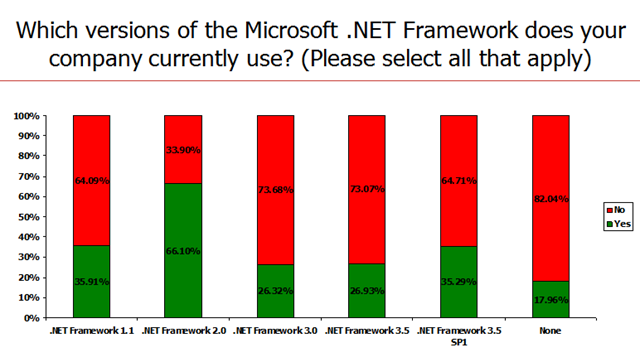 I can understand some people sticking with .NET 2.0 over 3.x for now (our own analysis showed that ~80% of site visitors using MSIE already had .NET 2.0 installed according to their user agents) but I don't know of any compelling reason to still be deploying .NET 1.1 applications (unless they have truly monstrous .NET 1.1 apps that are hard to port - but that seems unlikely). The percentages and questions are most intriguing and your report would be even more useful if it included the sample size of the survey: How many individuals responded to the survey? Please share this essential information. Sorry if I am just not seeing were you state that, but I do not see it. I have updated the post with some info on who completed it. In short - nearly 700 folks. MS are lucky that web-server apps came along to cover up their blushes. dotnet is simply not viable as a mass-distribution platform. Where are the mass consumer dotnet apps on the client? VB& is a great language. I've connected a VB6 app with oracle 10g databases, share data with a C# 3.0 app and make calls to dlls compiled in Borland 5 free compiler.